A man has completed a Morris dance from London to Norwich in memory of a friend who died aged 28. Nicholas Potts' 118-mile (190km) trip recreated Elizabethan actor Will Kempe's nine-day journey in 1599. Mr Potts was raising money for the British Heart Foundation in memory of Joshua Mills, who died from sudden adult death syndrome. 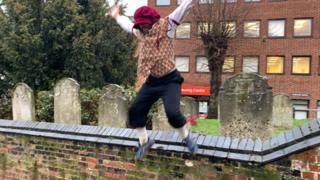 He finished the trip in Norwich by recreating Kempe's jump over the wall of St John Maddermarket church. He said: "There's a certain amount of elation with the jump over the wall. "It was a very nice moment at the end. I can hear him (Mr Mills) laughing at me. He had a distinctive laugh." Setting off from Shakespeare's Globe Theatre on February 26, he "pranced" in a "Morris style", dressed in full Elizabethan costume. On his first day he danced 21 miles from London to Brentwood, Essex, travelling on through Suffolk and Norfolk. The 37-year-old actor met Mr Mills six years ago whilst touring English language plays around Europe. A fundraising page has been set up to raise £50,000 for research into sudden adult death syndrome and has so far raised £4,605.